Political rivalries can sometimes claim the most surprising of victims. An example is when a group of United People’s Freedom Alliance (UPFA) supporters ran amok in Bibile town this week and vandalised a statue of celebrated patriot and hero of the Uva-Wellassa Rebellion, Bootawe Rate Rala. The vandals had broken and destroyed the statute’s sword and also damaged the statue by attacking it with rocks. The events had allegedly taken place after a UPFA campaign rally held in the town under the patronage of President Maithripala Sirisena came to an end on Thursday night. The group of UPFA supporters are also alleged to have attacked and damaged several party offices of rival Sri Lanka Podujana Peramuna (SLPP). 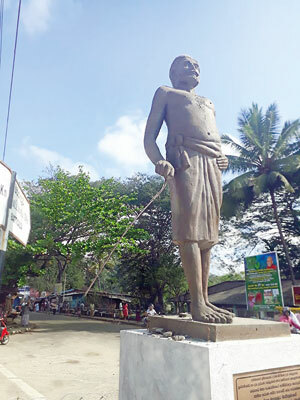 The vandalisation of Bootawe Rate Rala’s statue is also believed to have been politically motivated as the person responsible for its construction and placement is contesting the upcoming election from the United National Party (UNP). A prominent UPFA Minister, an area politician, who was elected to Parliament from the National List at the last General Election, is reported to have been behind the attack. Police are examining CCTV footage to identify those involved. Bootawe Rate Rala is revered in the region as one of the first leaders to join the Uva-Wellassa Rebellion of 1818. With political parties contesting under different symbols and parties to attract the highest number of votes, the candidates too have been confused at times. For instance, the United People’s Freedom Alliance (UPFA), whose symbol is the betel leaf is also contesting under the Sri Lanka Freedom Party (SLFP) whose symbol is the hand, in some of the areas. This week one of the candidates during his rounds of canvassing in the Kataragama area told voters to support the betel leaf for the good work done by former President Mahinda Rajapaksa. He was asked isn’t he under the leadership of President Maithripala Sirisena, but he had replied that yes, he was with President Sirisena but that it was former President Rajapaksa who was with the betel leaf clearly showing that he was not fully aware of the politics that was taking place in Colombo with all these symbols and coalitions. The report of the Commission of Inquiry into the bond scam identifies the official as J.K.D. Dharmapala, Chief Manager of the Risk Management Department of the Bank of Ceylon. He has been speaking on the telephone to Steffie Fernando of the Public Debt Department of the Central Bank of Sri Lanka (CBSL). President Maithripala Sirisena has cancelled the customary reception that follows today’s 70th Independence Day ceremonies. However, Government sources said it was due to the ongoing local polls campaign. 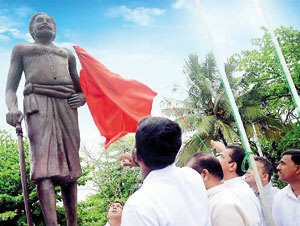 It was reaching its peak with just five more days to go for the poll on February 10. Officials were aware of the polls when invitations were sent out. However, instructions are learnt to have come from President Sirisena. At least 600 guests were expected at the event which is held annually after the independence day. “It’s not a formal sit down dinner but a buffet to which mainly senior public officials and diplomats are invited to,” an official of the Secretariat said.Some of the diplomatic missions were told to collect their invitations from the President’s Secretariat only to be told later that the event had to be cancelled. Squabbles within the Illankai Tamil Arasu Kachchi (ITAK) are coming out into the open in the heat of the election campaign. Addressing a political meeting, rebel ITAK MP Annamali Nadesu Sivasakthi charged that some ITAK MPs accepted bribes amounting of Rs 20 million to vote for the government’s last budget. But the allegation has resulted in him being slapped with a hefty letter of demand. ITAK General Secretary and Jaffna district MP Mavai Senathirajah in the letter sent through his lawyers is demanding Rs. 100 million for his defaming to some party members. The party says the money given to the ITAK lawmakers was from the decentralised budget and all MPs irrespective of the party they represent are entitled to receive it. The Ministry of Industries and Commerce on Thursday announced that prices of seven essential food items were being reduced in view of the 70th Independence Day. The items included Basmati rice, white raw rice, broken rice, dhal, green gram, big onions and dried chilies. The move drew the attention of opposition political parties which claimed that the reduction has nothing to do with Independence Day, but everything to do with next week’s local council elections. Inquiries were made from the Election Commission whether the price reduction violated election regulations as the move amounted to enticing voters. But, the Commission said the benefits were not directly offered by a candidate, but action would be possible only through court action. Under the regulations, an elected member could be unseated on the grounds of enticing voters, but in this case there was no candidate involved. However, the question remains as to why the food prices cannot be reduced for longer periods. A “new creation” dance to be performed at the Independence Day celebrations today using laptops as a prop was changed after a backlash on social media. The laptop which was used in place of the winnowing fan (kulla) which is used in the traditional dance drew more ridicule when photographs of the “laptop dance” appeared in newspapers and were widely circulated on social media. 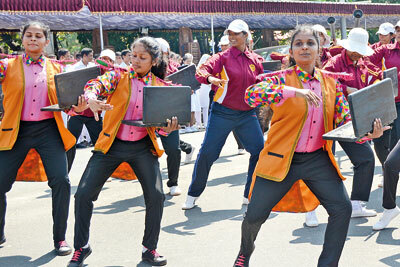 An Education Ministry official said that the dance will be performed at today‘s celebrations but minus the laptops. The cultural pageant for this year’s celebrations will consist of 550 dancers, musicians and drummers.